This is my 14th installment of Babywearing Stories 365. Each installment features a babywearer in 1 photograph and their answers to 5 questions. My goal is to normalize, promote and celebrate daily Babywearing, moving beyond *what* we use to carry our babies and shifting focus back on *why* and *where* we carry. I hope to share the stories of moms, dads, and babywearing caregivers all over the world. Enjoy! Me (Glenys), DH (Mike), and Ian (age: 5 months). 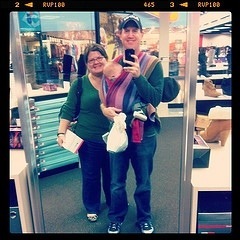 We are shopping for Christmas presents at the mall in early December (2011). Mike has Ian in a Girasol (5) Felize in our favorite carry when he was little (a ‘popable’ variation on a FWCC). At the time we had only just started transitioning from stretchy wraps (Moby and DIY stretchies) to a woven wrap or SSC because he had been growing fast and had gotten too big and heavy for strechies to be safe. We were window shopping at the mall, enjoying the sights and sounds of Christmas decorations and looking for presents (specifically snuggly socks for grandmothers). Mike was enjoying babywearing. This was the first time he had worn Ian out that he had fallen asleep in the carrier. This was a mid-morning Saturday in early December, 2011 — nap time, but at the mall before the crazy crowds were there. I started babywearing when Ian was a very small guy with a Moby and soon after with stretchy wraps that I made (cut) from lighter-weight jersey (Texas summers y’all — whoa! — he was born in July). A friend with a (then) 4 year old recommended it for closeness, which appealed to me a lot (Ian is adopted, and in the beginning I had fears about bonding and closeness and so forth). And after about three weeks, it helped to be wearing him in the late afternoons especially with his afternoon, overstimulated sad-guy times. You know that time — when you hope your partner will come home from work early because the baby has lost. his. mind. When I was wearing Ian, we could (more often than not) sail through that time and have a good afternoon without the crazy. We also love babywearing because we loved getting out of the house with Ian and felt most comfortable in crowds with him in a carrier. Especially when he was very little, many people seemed to feel compelled to introduce themselves and cuddle his hands or caress him, sometimes before they said anything to us! (I understand, of course, he was and is adorable!) So having him in a wrap meant that we could be close to him and cut down on germy contact and snuggle while walking or shopping or hanging out with friends. Also, he could much more easily snuggle his head in and nap whenever he needed it, which was much more difficult for him riding around in a stroller (we really tried it when he was little, and it just never worked? and we had the huge Cadillac of a stroller/ carseat combo that everyone told us we couldn’t live without — ugh! it was just a sweating pain — for us, at least). We still wear Ian almost everywhere (even though/ because he now loves walking and ‘helping’ everywhere we go). I couldn’t imagine trying to run any errands without a carrier (our favs now are an Ergo sport and a Two Mommas Designs toddler-size half-buckle that we call ‘tape cassette’ because the fabric of the body is a kitschy one of cartoon-like old tapes). I’ve frequently skipped errands if I don’t have a carrier, actually. Without it, Ian will endlessly want to be in and out of the cart or will want to open all the products going into the shopping cart. While in a wrap, he’s much more content (most of the time) and may even fall asleep, and then be ready to play and run outside once we are home. I can’t imagine being a mom without babywearing!